Hey Everyone! I’m Amanda Moreau, and I host 3 hours of Classic Rock every Saturday from 9am-12pm! I’ve been blessed with the gift of gab, fidgety fingers, and a love for music that can’t be denied. 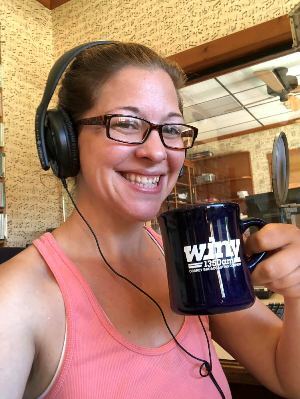 I’ve had an interest in broadcasting my entire life, dreaming of being a radio jockey since childhood, and I am so honored to be a part of the WINY family! Classic Rock is just one of many genre’s of my musical interest, and I like to think it’s because my parents raised me so well…Being born in 1983, I wasn’t really there, so they can have the credit! If you want to really pique my interest, bring up 90’s Grunge, or 60’s Pop! Outside of WINY, I’m the proud mother to my beautiful daughter, Harmony, and during the week I work for myself, walking and caring for dogs and other pets. I am a townie of Putnam, but originally grew up down the road in Pomfret Center. I graduated from Woodstock Academy with the class of 2002. I love crafting, dancing, hiking, camping, listening to music and being surrounded by those I love. My friends and family have helped shape me to be the person I am today, and I can’t thank them enough for their love and ongoing support.